He had a very strong sense of his destiny as an Orthodox ruler. Although he had an opportunity to flee the country with his family and seek refuge outside Russia, he and his Empress deliberately chose to stay and accept whatever awaited them. He had been born on the feast of the Prophet Job and because of this he often remarked to his advisors: "I have a secret conviction that I am destined for a terrible trial, that I shall not receive my reward on this earth." Terrible was the night of the murder of the Tsar"! On that unspeakable night, the prisoners were all in a deep sleep when they were awakened and ordered to dress in order to leave the city.... The Imperial Family descended to the basement where the Sovereign sat down, with his ill son, on a chair in the middle of the room. The Duchesses, the doctor, and three dedicated servants were seated around him. Every one was waiting for the signal to depart. At the executioner's announcement (which stunned all the prisoners) of the impending execution, the Empress succeeded in crossing herself. She was killed instantly, together with the Sovereign. God spared them from hearing the groans of the Tsarevitch and the cries of the wounded Grand Duchess Anastasia. The first bullets did not bring death to the youngest ones and they were savagely killed with blows of bayonets and gun-butts and with shots at point-blank range. Olga, the oldest daughter, born in 1895, was fair, with golden-brown hair (the lightest in the family) and beautiful blue eyes. She was innocent, modest, sincere and kind. She liked simplicity and paid little attention to dress. She was most similar to her father, whom she loved better than anyone else. She had a quick mind and possessed the virtue of reasoning. According to her tutors, she had a "crystal'' soul and a bright smile; inner joy radiated from her and had an uplifting effect on those around her. Like her father, Olga deeply loved Russia and the Russian people. When faced with the possibility of marriage to a foreign prince, she flatly refused, saying, "I do not want to ever leave Russia. I am Russian and wish to remain so." Thus she stayed on in her homeland to receive the crown of martyrdom. 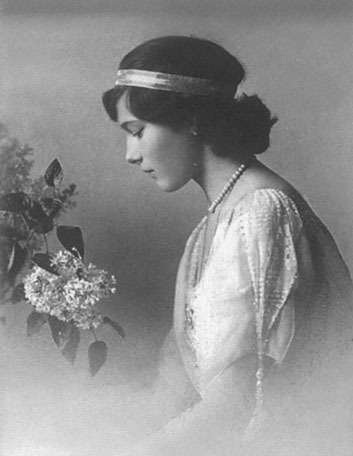 Tatiana, the second daughter, born in 1897, was a tall, thin and elegant girl. She had a darker complexion than the others. She was somewhat reserved, dutiful and pensive; she was often more decided in her opinions than her sisters. She was a talented pianist and also painted and embroidered well. 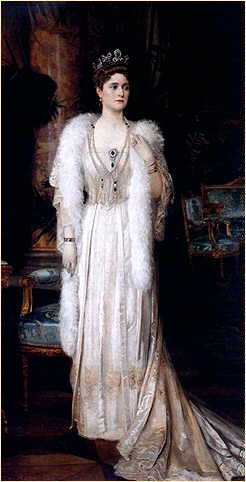 Tatiana was her mother's favorite, having inherited the Empress' nobleness and sense of discipline. 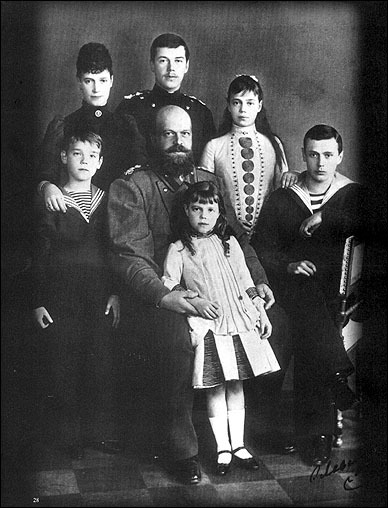 The younger children nicknamed Tatiana "the Governess." Maria, the third daughter, born in 1899, was strong, broadly-built and good looking, with light gray eyes. She could paint and draw, and played the piano competently. She was very fond of children and inclined to domesticity, and would have made an excellent wife and mother. Maria had the rare quality of being perfectly happy in ally surroundings, even when the family was imprisoned in Tobolsk. For this reason she was chosen by her parents to accompany them when they were forced to separate from the family and embark upon their last fateful journey to Ekaterinburg. 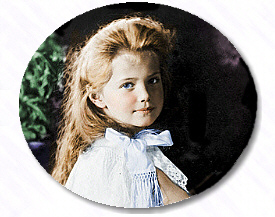 Anastasia, the youngest daughter, born in 1901, was initially a tomboy and the family clown. She was shorter than the others, had a straight nose and beautiful gray eyes. Refined and witty, she had the talent of a comedienne and made everyone laugh. She had a small dog of Japanese breed, which the whole family loved. Anastasia carried this dog in her arms when she went down into the cellar at Ekaterinburg on the fateful night of July 4th, and the little dog was murdered together with her. Alexis, the heir apparent, was a very special child. He was born in 1904, in response to prayers offered by the Imperial family and the entire faithful populace during the days of glorification of Saint Seraphim of Sarov, asking God to grant Russia an heir. However, though born the heir lo the Russian Empire, Alexis could not inherit it, since Russia was already set on its apocalyptic course; instead, he inherited an incomparably higher kingdom - the Kingdom of Heaven. Alexis was destined for martyrdom from the moment of his birth: the only and beloved son, he was the young Isaac who was actually sacrificed, the innocent sacrificial lamb who was worthy to atone for the sins of his people. He was born with the dreaded illness of hemophilia, which showed up when he was only six weeks old, and which caused him great pain and suffering for the entire 14 years of his brief life. It was also the cause of the greatest anguish for his family, especially his parents, and was a contributing factor to the fall of the Empire. And yet this young boy bore his terrible burden with great fortitude, silently and without grumbling, in a true Christian manner. At the same time he was like any other boy: he enjoyed games and horseplay, engaged in outdoor activities with other boys whenever possible, loved to go sailing with his father, teased his sisters, liked to watch movies, make boats and other paper models, and, though a very clever boy, was not fond of books. He had a kind heart, liked to give presents everyone, and he loved animals. He was a lively and cheerful child, a universal favorite, beloved by all with whom he came into contact. His mother loved him passionately, suffering a mother's indescribable anguish over his pains and his illness, which he had inherited from her side of the family. 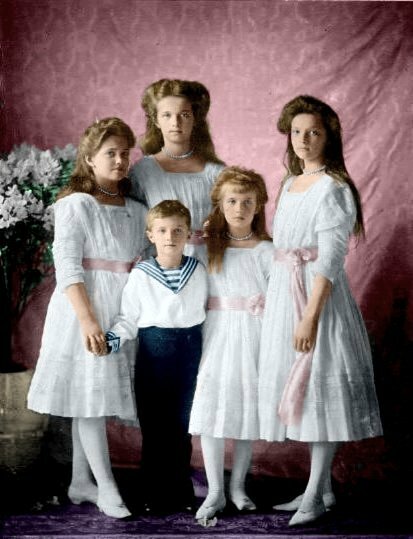 God granted these extraordinary royal children a spiritually royal fate on earth: after having spent their childhood and youth in a most glorious Orthodox way of life, in absolute innocence and purity, they were ready for the crowning touch - the shining crown of martyrdom. Their Calvary began on March 2, 1917, the day of the Tsar-Martyr's abdication - first in their palace at Tsarskoye Selo, then at the Governor's house in Tobolsk, and finally, at the Ipatyev house - the "House of Special Purpose" - in Ekaterinburg, they suffered increasing stages of harassment, humiliation and deprivation. Their prison guards became progressively more insolent, heartless and brutal, subjecting them to insult, mockery and torment. The royal martyrs bore it all with great fortitude, strength of spirit, true Christian humility and total acceptance of the will of God. They sought solace in church services, home prayers and spiritual reading. They were heinously murdered, these pure and innocent children, in the night of July 4, 1918, and from the blood-soaked cellar in Ekaterinburg they passed triumphantly into the royal palace of the King of Heaven. O holy Royal Martyrs Nicholas, Alexandra, Alexis, Olga, Tabana, Maria and Anastasia, pray to God for us! Tsar-Martyr Nicholas was born in St. Petersburg on May 6, 1868, the day upon which the Holy Church celebrates the memory of St. Job the Long-Suffering. And how prophetic this turned out to be - for Nicholas was destined to follow the example of this great Old Testament Saint both in circumstance and in faith. Just as the Lord allowed the Patriarch Job to suffer many things, trying him in the fire of calamity to test his faith, so was Nicholas tried and tempted, but he too never yielded and remained above all a man of God. His grandfather was Tsar Alexander II, the liberator of the peasants, who loved him and called him "sun ray". "When I was small," said Nicholas to his daughters, "they sent for me every day to visit my grandfather. My brother George and I had the habit of playing in his study while he was working. His smile was so pleasant, although his face was usually handsome and calm. I remember that it made a great impression on me in my early childhood... Once my parents were away, and I was at the all-night vigil with my grandfather in the small church in Alexandria. During the service there was a powerful thunderstorm, streaks of lightning flashed one after the other, and it seemed as if the peals of thunder would shake even the church and the whole world to its foundations. Suddenly it became quite dark, a blast of wind from the open door blew out the flame of the candles which were lit in front of the iconostasis, there was a long clap of thunder, louder than before, and I suddenly saw a fiery ball flying from the window straight towards the head of the Emperor. The ball (it was of lightning) whirled around the floor, then passed the chandelier and flew out through the door into the park. My heart froze, I glanced at my grandfather - his face was completely calm. He crossed himself just as calmly as he had when the fiery ball had flown near us, and I felt that it was unseemly and not courageous to be frightened as I was. I felt that one had only to look at what was happening and believe in the mercy of God, as he, my grandfather, did. After the ball had passed through the whole church, and suddenly gone out through the door, I again looked at my grandfather. A faint smile was on his face, and he nodded his head at me. My panic disappeared, and from that time I had no more fear of storms." Dominic Lieven writes: "Aged 10, Nicholas was handed over to a military governor, General G.G. Danilovich... Danilovich himself invited specialists to come to the palace to teach the heir a range of subjects including four modern languages (Russian, French, English and German), mathematics, history, geography and chemistry. Of the subjects Nicholas was taught, history was much the closest to his heart. His membership of the Imperial Historical Society from the age of 16 was more than merely honorary. Many years later, in the enforced leisure of his Siberian exile, he returned to reading works of history. He commented to his son's English teacher, Sydney Gibbes, that 'his favourite subject was history' and that he 'had to read a good deal when he was young, but had no time for it later'. In his youth and adolescence Nicholas had, however, also read fiction in English, French and Russian. Someone capable of mastering four languages and coping with Dostoevsky and the historians Karamzin and Solovyov at this age cannot have been without brains. "Of his tutors, Charles Heath seems to have been closest to the heir... General V.N. Voeykov, the last Commander of the Imperial Palaces in Nicholas's reign, knew the monarch well. He commented that 'one of the Emperor's outstanding qualities was his self-control. Being by nature very quick tempered, he had worked hard on himself from his childhood under the direction of his tutor, the English Mister Heath, and had achieved a tremendous degree of self-possession. Mister Heath frequently reminded his imperial pupil of the English saying that aristocrats are born but gentlemen are made.'" "It is necessary to pray for the little sparrows; may Dearest God not take it - He has enough sparrows." On March 13, 1881, the Tsar-Liberator was murdered by a revolutionary fanatic. On a Petersburg street, in broad daylight, a bomb was thrown which injured some of the guards but left the Tsar unhurt. With disregard for personal safety, he left his carriage and was attending to the injured when a second bomb was thrown, fatally wounding him and many others. He was rushed to the Winter Palace where he died in the presence of his grief-stricken family. Later, on the spot of the murder, there was built a magnificent church, Christ the Saviour "Upon the Blood", which became the stronghold of the Catacomb Church in Petrograd after the revolution. "I saw a fluttering of his eyelids. The light blue eyes of my grandfather opened. He tried to smile. He moved his finger, but could not raise his hand and say what he wanted, but he undoubtedly recognised me. Protopresbyter Bazhenov came up to him and gave him Communion for the last time, we all fell on our knees, and the Emperor quietly died. Thus was it pleasing to the Lord." Submission to the will of God was the distinguishing characteristic of Tsar Nicholas II's character. His faith in the Divine wisdom that directs events gave him that supernatural calm which never abandoned him. We fear catastrophes, but, as St. John Chrysostom said, there is only one thing that is truly fearful - sin. The Lord is in control of everything; everything is either blessed by Him or allowed by Him. Nicholas' parents were Tsar Alexander Alexandrovich and Tsaritsa Marie Fyodorovna. Alexander was a man with a strong man who feared God and became one of Russia's great Tsars, though his reign was short (1881-1894). Nicholas' mother, formerly Princess Dagmar of Denmark, was a loving and supportive wife and mother who accepted her adopted faith, Holy Orthodoxy, into her soul and along with Alexander transmitted it to her children, building their house upon a rock. "And when the flood arose, the stream beat vehemently upon that house, and could not shake it: for it was founded upon a rock" (Luke 6.48). The activity of the hateful revolutionaries was to plague Nicholas and his family throughout their lives. In 1888, while Tsar Alexander III and his family were travelling towards Kharkov, the imperial train was rocked by two explosions and derailed. 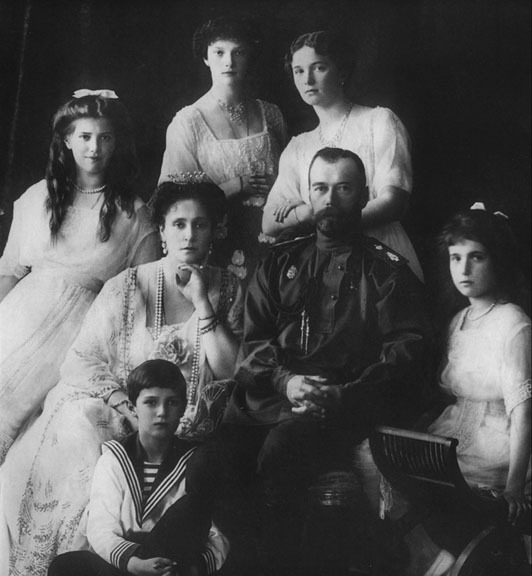 Only the level-headedness and great physical strength of the Tsar kept the Royal Family from being killed. Despite such difficult circumstances, Nicholas, now the Tsarevich, was being formed in all the Christian virtues. During his youth his kindness to others and selflessness impressed all who met him. While living frugally himself, he gave freely to those less fortunate. It is known that he often anonymously gave scholarships and other gifts through the agency of one of his childhood teachers. The Tsarevich entered into military service, which formed him in manhood through discipline and responsibility. It was during this period, on a visit to Japan, that he was attacked by a Japanese policeman with a sword and injured. As the heir of the Russian throne, he could have easily had the policeman punished severely. But he chose instead to ignore the incident, preferring to turn the other cheek and forgive. This wound, to his head, was to cause occasional pain throughout the rest of his life. "A few days after this, there was an attempt on the life of the heir. A Japanese fanatic struck him on the head with a sabre, which gave him a minor wound since Prince George, who was all the time with the heir, parried the blow with a bamboo shoot. By command of Alexander III, the shoot which had played this role was encrusted with diamonds and returned to Prince George. Thus did the shoot prove stronger than the sword, and the shoot shone. The records witness that after his visit to the hermit Terakuto the heir was for a long time thoughtful and sad." By 1894 the health of Nicholas' father, Tsar Alexander, began to fail, and on October 20 he reposed under the loving hand of his confessor, St. John of Kronstadt. By this time Nicholas was already engaged to Princess Alix of Hesse (Germany); and they were married one month after Alexander's repose. There had been obstacles to this marriage. Tsar Alexander III had been opposed to the match, as had been Kaiser Wilhelm. Grand Duchess Elizabeth, Princess Alix's sister, wrote to Queen Victoria: "The world is so spiteful, and not knowing how long and deep this affection on both sides has been, the spiteful tongues will call it ambition, as if to mount this throne is enviable." But the major obstacle was the Princess' faith. The Princess had been born and raised as a Lutheran and was very devoted to her faith, but she needed to convert to Orthodoxy in order to become Empress of the Russian nation. Being a highly principled woman, she did not take this as a light matter and at first resisted. But God in His loving-kindness did not abandon her; and soon, after a number of meetings with an Orthodox archpriest who expounded to her the Faith, she gladly accepted baptism. Her conversion was anything but nominal. 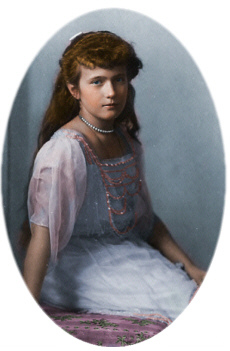 The depth of her embrace of Orthodoxy and the strength which it gave to her family was to be a spiritual reproach to the modern Russian nobility and to the "intelligentsia" who, listening to the spirit of antichrist, had gradually become ashamed of their faith, considering it something "outdated". "As Empress, Alix held to an intensely emotional and mystical Orthodox faith. The superb ritual and singing of the Orthodox liturgy moved her deeply, as did her sense that through Orthodoxy she stood in spiritual brotherhood and communion with her husband's simplest subjects. But alongside this strain of Christian belief, Alix was a born organizer, an efficient administrator and a passionate Christian philanthropist. Though her interests included famine and unemployment relief, and professional training for girls, her charitable work was above all concerned with help for the sick and the world of medicine. Typically, even on holiday in the Crimea, Alix toured the hospitals and sanitoria in the neighbourhood, taking her young daughters with her because 'they should understand the sadness underneath all this beauty'." The official coronation took place in May of 1896. The young Tsar and Tsaritsa spent the majority of their time in seclusion and intense prayer, preparing themselves for the awesome responsibility of governing, with God's help, the largest nation in the world, which was the protector of the Orthodox Faith. The coronation of a tsar is no mere secular affair of state. As Bishop Nectarius (Kontzevich) has written, "The Tsar was and is anointed by God. This mystery is performed by the Church during the coronation, and the Anointed of God enters the Royal Doors into the altar, goes to the altar table and receives the Holy Mysteries as does the priest, with the Body and Blood taken separately. Thus the Holy Church emphasises the great spiritual significance of the podvig (struggle) of ruling as a monarch, equalling this to the holy sacrament of the priesthood... He (the Tsar) is the sacramental image, the carrier of the special power of the Grace of the Holy Spirit." "O Lord God of our fathers, and King of kings, Who created all things by Thy word, and by Thy wisdom has made man, that he should walk uprightly and rule righteously over Thy world; Thou has chosen me as Tsar and judge over Thy people. I acknowledge Thine unsearchable purpose towards me, and bow in thankfulness before Thy Majesty. Do Thou, my Lord and Governor, fit me for the work to which Thou hast sent me; teach me and guide me in this great service. May there be with me the wisdom which belongs to Thy throne; send it from Thy Holy Heaven, that I may know what is well-pleasing in Thy sight, and what is right according to Thy commandment. May my heart be in Thine hand, to accomplish all that is to the profit of the people committed to my charge, and to Thy glory, that so in the day of Thy Judgement I may give Thee account of my stewardship without blame; through the grace and mercy of Thy Son, Who was once crucified for us, to Whom be all honour and glory with Thee and the Holy Spirit, the Giver of Life, unto the ages of ages. Amen." Peter I and Empress Catherine II. He commissioned the painting of large numbers of icons in the Byzantine and Old Russian styles, adorning many churches with them. In the words of Archpriest Michael Polsky, "In the person of the Emperor Nicholas II the believers had the best and most worthy representative of the Church, truly 'The Most Pious' as he was referred to in church services. He was a true patron of the Church, and a solicitor of all her blessings." Emperor stressed the importance of educating the peasant children within the framework of church and parish and, as a result, the number of parish schools grew to 37,000. Christian literature flourished at this time. Excellent journals were published, such as Soul-Profiting Reading, Soul-Profiting Converser, The Wanderer, The Rudder, The Russian Monk, and the ever-popular The Russian Pilgrim. The Russian people were surrounded by spiritual nourishment as never before. 1903, at his insistence. At this time, Nicholas was made aware of the future apostasy and downfall of the Russian nation and Church through a prophetic letter written by St. Seraphim himself. The saint had, shortly before his death in 1833, written this letter, sealed it with five wax seals and addressed it "to the Tsar in whose reign I shall be glorified". He then gave it to Elena Motovilov, the young wife of N.I. Motovilov, who is now well-known for recording his conversation with the saint about the acquisition of the Holy Spirit. She kept that letter for seventy years and gave it to the Tsar at the glorification ceremony. While the exact contents are today unknown, it is nevertheless certain that St. Seraphim prepared Nicholas for the coming tribulations. Furthermore, on the return trip from Sarov, the Royal Family visited St. Seraphim's Diveyevo Convent where Blessed Pasha (Parasceva) the Fool-for-Christ spoke to them several hours; it is said that she foretold to them their own martyrdom as well as that of Holy Russia. "I don't believe you, it cannot be!" "This is for some little trousers for your son, and when he is born,you will believe what I have been telling you." They left her cell pale and shaken but resolute - they would accept with faith whatever God had prepared for them, esteeming the incorruptible crown of martyrdom higher than corruptible earthly crowns; electing to accept the cup of suffering offered to them by God Almighty, that by drinking of it they might offer themselves up as a sacrifice for their people. "Your Majesty, come down from the throne yourself!" Not long before her death in August, 1915, Blessed Pasha was continually making prostrations to the ground in front of the portrait of the Tsar. When she was worn out, her cell-attendants lifted her up. "Mamashenka, why are you praying to the Tsar?" "Stupid, he will be higher than all the tsars." There were two portraits of the Tsar: one of him with the Tsaritsa and the other of him alone. But she kept prostrating to the one of him alone. "I don't know, a monk saint, perhaps a martyr!" Being a peace-maker by nature, the young tsar made an unprecedented suggestion to the world early in his reign - that all nations come together and meet in order to cut their military forces and submit to general arbitration on international disputes. The result of his proposal, the Hague Peace Conference, was convenedon May 18, 1899, and served as the precedent for the later League of Nationsand United Nations. In 1921, the American President, Warren Harding, officially acknowledged the Tsar's noble efforts towards the limitation of armamentsby way of binding agreements among the Powers. The Tsar was unparalleled in Russian history for his mercifulness. He pardoned criminals, even revolutionaries, and gave away vast quantities of his own land and money to alleviate the plight of the peasants. It is believed that he gave away the last of his personal wealth during the Great War, to support the war effort. Even as a child he often wore patched clothing while spending his personal allowance to help poor students to pay for their tuition. poll tax was abolished and a voluntary programme of hospitalisation insurance was introduced, under which, for a payment of one rouble per year, a person was entitled to free hospitalisation. The parity of the rouble was increased greatly on the international markets during his reign. In 1897, a law was enacted to limit work hours; night work was forbidden for women and minors under seventeen years of age, and this at a time when the majority of the countries in the West had almost no labour legislation at all. As William Taft commented in 1913, "the Russian Emperor has enacted labour legislation which not a single democratic state could boast of". "Ach, poor (so-and-so), how sorry I am for him!" 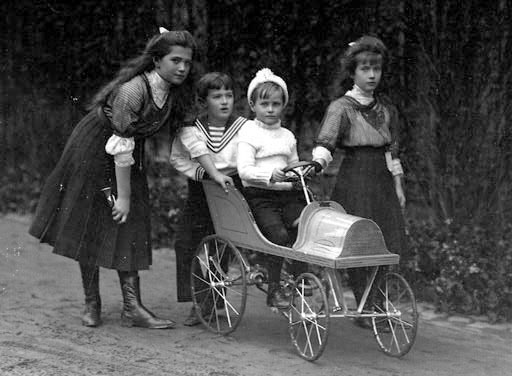 "I fear nothing until 1918..."
Dominic Lieven writes: "Between 1895 and 1901 the Empress had given birth to four daughters: Olga, Tatiana, Marie and Anastasia. The four little girls were beautiful, healthy and lively children who were greatly loved by their parents. Nicholas was a fine father and the family circle was full of love, warmth and trust. If the Emperor had a favourite it was probably Tatiana, whose personality came closest to that of her mother. Olga, his eldest daughter, was the most thoughtful, sensitive and intelligent of the four. Marie, the third, with huge grey eyes and a warm-hearted, simple, friendly manner, was always the easiest to get on with at first acquaintance. Anastasia, born in 1901, was notorious as the family's comedian. Under Russian law, however, no woman could inherit the crown. Had Nicholas died before 1904, the throne would have gone to his kind-hearted but weak-willed younger brother, the Grand Duke Michael. Since Michael was a bachelor in 1904 an subsequently contracted an illegal and morganatic marriage, the Romanov inheritance would then have passed to a younger brother of Alexander III,the Grand Duke Vladimir, and his descendants. Tension and mutual dislike between the 'Vladimir branch' and the imperial couple were never far below the surface in the twentieth century. Much therefore hung on the life of the little boy born in August, 1904. All the more horrifying was the discovery that the child had haemophilia. "Inevitably, however, it was the mother who bore the greater burden during her son's illnesses, not to mention the incessant worry even when he was relatively healthy. Nor could she escape the guilt born of the knowledge that she was the cause of her son's suffering and of the extra burden of worry about his dynasty's future which had been placed on her husband's shoulders. Physically frail and always very highly strung, the Empress poured her last drop of energy into watching over her son and nursing him duringhis attacks... The effort cost the Empress dear. She was often too ill and exhausted to play the role of a monarch's consort, incurring great odium as a result. Moreover, the strain of Alexis' illness pushed his mother close to nervous collapse. As the Grand Duchess Olga commented, 'the birth of a son, which should have been the happiest event in the lives of Nicky and Alicky, became their heaviest cross.'" Shortly after the birth of Alexis, according to the Procurator Lukyanov, the Tsar went to the metropolitan of St. Petersburg and asked for his blessing that he abdicate from the throne and become a monk. But the metropolitan refused to bless this. The tragedy of Alexis' haemophilia was followed by a succession of other tragedies, even a small number of which would have broken a lesser man. But for the Tsar they only served to further refine the nobility of his soul. First there was the disastrous war with Japan of 1904-05 during which most of the Russian fleet was lost. At this time also, sensing public disappointment with the defeat, the nihilistic enemies of Christ seized the moment and instigated mutinies, strikes, riots and assassinations. Here was a whole class of society who were, in the words of St. Paul, "... lovers of theirown selves, boasters, proud, blasphemous, disobedient to parents, unthankful, unholy, without natural affection, trucebreakers, false accusers, incontinent, fierce, despisers of those who are good, traitors, heady, highminded..." (II Timothy 3.2-4). The last great prophet of Holy Russia, St. John of Kronstadt, who clearly foresaw the approaching catastrophe, repeatedly exhorted his countrymen to repent and return to their former piety and support the God-anointed ruler or face untold disaster, both here and in the world to come. In 1905 St. John said: "We have a Tsar of righteous and pious life. God has sent a heavy cross of sufferings to him as to His chosen one and beloved child, as the seer of the destinies of God said: 'Whom I love, those I reproach and punish' (Rev. 3.19). If there is no repentance in the Russian people, the end of the world is near. God will remove from it the pious Tsar and send a whip in the person of impure, cruel, self-called rulers, who will drench the whole land in blood and tears." "The work must be based exclusively on the bare facts... We have nothing to silence, since more blood has been shed than necessary.... Heroism is worthy to be noted on an equal footing with failures. It is, without exception, necessary to aim at recording the historic truth inviolably." The year 1905 was to be a "rehearsal" for the bloody events which took place twelve years later. Encouraged by Lenin and Trotsky, a campaign of disorders was begun all over the Empire. Many high government officials were murdered in the streets, among whom, in 1905 was Nicholas' cousin, the Grand Duke Sergius, husband of the Empress' sister, Grand Duchess Elizabeth. them whether they had a candidate for the patriarchate. When they said no, he offered himself as a candidate. The bishops were shocked and refused his offer. The Tsar, being a humble man, never brought this subject up again. On one occasion, the emperor was talking about the sufferings that lay ahead of him with his prime minister at the time, Peter Arkadyevich Stolypin. "It was not for nothing," he said, "that I was born on the day of Job the Much-Suffering." "I have more than a presentiment that I am destined for terrible trials, and that I shall not be rewarded for them on this earth... Nothing that I have undertaken succeeds for me; I have no successes. Man's will is so weak... How many times have I applied to myself the words of the holy Job, 'For the thing that I fear comes upon me, and what I dread befalls me.'" "Perhaps an atoning sacrifice is necessary for the salvation of Russia. I shall be that sacrifice. May the will of God be done!" Stolypin later recalled: "He made this triumphant declaration to me in the simplest, calmest and most even voice. There was a strange mixture inhis voice, and especially in his look, of decisiveness and meekness, at the same time unshakeable and passive, unclear and well-defined; as if he was expressing, not his own will, but was rather bowing to some external power - the majesty of Providence." After the disturbances of 1905-06, Russian entered into a period of great prosperity. With the wise and dynamic assistance of Stolypin, Tsar Nicholas led the nation through a time of such growth - agricultural, economic, educational and industrial - that had the first World War not occurred, Russia would have undoubtedly become the leading nation of the world. "Peter I had little money and so he used forced labour and this costhim the lives of a million of his subjects... the realisation of this project would cost between 10 and 15 millions of the premature deaths of my subjects... I cannot in conscience sacrifice millions of my subjects, and therefore we must endure (without industrialisation)." "We will hope in God. If the war is short, we will win, but if it is long, then such is our fate." Again, the head of the police promised the Tsar that there would be no revolution in Russia for a hundred years if the Tsar would permit 50,000 executions. The Tsar quickly refused this terrible proposal. After the revolution, however, the Bolsheviks thought nothing of butchering many millions of people for acts of "civil disobedience". The Tsar tried to heal the revolutionary illness with mercy and forgiveness. One student was sentenced to death, but on the eve of the execution, his fianc=E9e petitioned the Tsar for a commutation. The Tsar was reached by having his personal attendant call him from his bedroom. He received the petition and sent off a telegram commuting the sentence. He praised the attendant for his daring and even had the student sent to theCrimea for treatment of his tuberculosis. "Irritation solves nothing, and besides, a sharp word from me would sound more offensive than from anyone else." these schools, in spite of a campaign by the Duma to close them. He also opened special industries for the city poor to help them earn their own living. In 1914, Russia was forced to enter World War I. 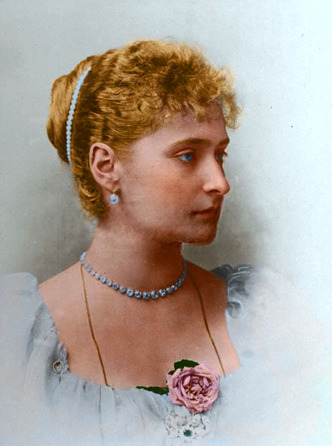 As Grand Duchess Elizabeth testified, the peace-loving Tsar did not want this war, but aggression against Orthodox Serbia by Germany left him no other honourable choice. Palace. The French Ambassador observed that "Nicholas II prayed with a holy fervour which gave his pale face a movingly mystical expression". The tsar's devotion to prayer was commented on by many; his private car included a "veritable chapel", and he never missed a service while in army headquarters. 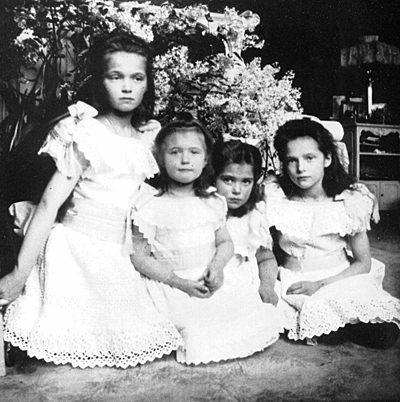 As soon as the war broke out, the Empress and the four Grand Duchesses (Olga, Tatiana, Maria and Anastasia) became nurses; and hospitals were opened at Tsarskoye Selo, near the family's residence, where wounded soldiers were brought. They worked long hours, diligently and tirelessly following the commandment of Christ to visit the sick, since "inasmuch as ye have done it unto the least of these My brethren, ye have done it unto Me" (Matthew 25.30). Anna Vyrubova, the Empress' closest friend, wrote: "I have personally seen the Empress of Russia in the operating room, assisting in the most difficult operations, taking from the hands of the busy surgeon amputated legs and arms, removing bloody and even vermin-ridden field dressings." Vyrubova says that she was a "born nurse", who "from her earliest accession took an interest in hospitals, in nursing, quite foreign to native Russian ideas. She not only visited the sick herself, in hospitals, in homes, butshe enormously increased the efficiency of the hospital system in Russia. Outof her own private funds the Empress founded and supported two excellent schools for training nurses, especially in the care of children." When the war broke out, the Tsar ordered that all the money deposited in Britain be returned to Russia. The British did not want to comply. The Tsar then called a conference of bankers and merchants of the highest rank. Heput 92 million roubles on the table and asked them voluntarily "to give moneyfor the military victory of which the Russian people will be proud." The merchants and bankers refused to give any money. But the Tsar expended the whole of his fortune on the war effort. At first the war went well, and the country was united heart, soul and body in patriotic fervour behind their Tsar. But soon, due to poor communications, low-level mismanagement and subversive treachery, problems arose in supplying the armed forces with ammunition and food. The army began to suffer defeats, and many men were killed. 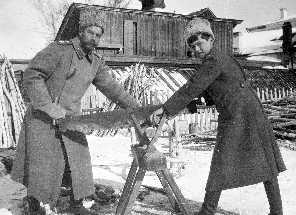 It was at this crucial time that the Bolsheviks, fuelled by German money, went to work spreading discord among the troops and at home. Alliance. This telegram brought prompt action, and dozens of Italian, French and English ships set about evacuating the dying army to Corfu. Once, during manoeuvres, the Tsar and his suite were brought breakfast. However, when he discovered that nothing had been prepared for the soldiers who were holding his horses, he would not eat until all the soldiers had received their rations. He also showed great compassion for the wounded. "And then an improbable event took place which shook all the monks of the monastery: two elders in the clothing of schema-monks were quietly climbing the steep steps that led upwards from the direction of the sea. They could have known nothing about the arrival of his Majesty, for neither the abbot nor the brothers themselves, nobody knew about the visit of his Majesty, which had been decided on quite suddenly, at the last minute. That was what caused the disturbance among the brotherhood. I told his Majesty about this and saw that this event made an impression on him, but he said nothing and the moleben continued. "There, at the point where the wooden staircase ended, stood the twoold elders. One had a long white beard, while the other had a short beard. When his Majesty came up to them, they both silently bowed to the earth before him. His Majesty was clearly embarrassed, but he said nothing and slowly bowed to them. "... Now, after all that has happened, I wonder: did the schema-monks not foresee with their noetic eyes the destinies of Russia and the Royal Family, and did they not bowed down to the feet of his Majesty the Emperor Nicholas II as to the great sufferer of the Russian land? "Living here, as a refuge, many years later, I heard from one reliable person that his Majesty himself told him that once, as he was standing onthe deck of the Standart, and passing by the monastery of St. George, he saw what seemed to be the figure of a monk in the rocks, continually blessing his Majesty as he was standing on the deck of the Standart with a large sign of the Cross, until the Standart disappeared from view." In August, 1915, Igumen Seraphim (Putyatin) visited Blessed Pasha of Sarov. "In my presence the clairvoyant kissed the portraits of the Tsar and his family several times. She placed them together with the icons and prayed to them as to holy martyrs. Then she wept bitterly. I understood these allegorical acts only when there took place the great sorrows experiencedby the Tsar and his Family and linked with the war; for although they were not torn by grenades or wounded by lead bullets, their loving hearts were torn by the unprecedented sorrows and flowed with blood. They were truly bloodless martyrs. In the same way the Mother of God was not wounded by weapons of torture, but at the sight of the suffering of her Divine Son, as Righteous Simeon said, a sword pierced her heart. Then the eldress took little icons of the Mother of God of Loving Tenderness, in front of which St. Seraphim died, and blessed them from a distance for his Majesty and his Family. Then she gave them to me and asked me to send them to them. She blessed icons for his Majesty, her Majesty, the Tsarevich, the Great Princesses Olga, Tatiana, Maria and Anastasia, Great Princess Elizabeth Fyodorovna and A.A. Vyrubova. I asked her to bless a little icon for Great Prince Nicholas Nikolayevich. She blessed one, but not of the Mother of God of Loving Tenderness, but of St. Seraphim. She blessed icons for nobody else, although I even asked her to bless some for some people. 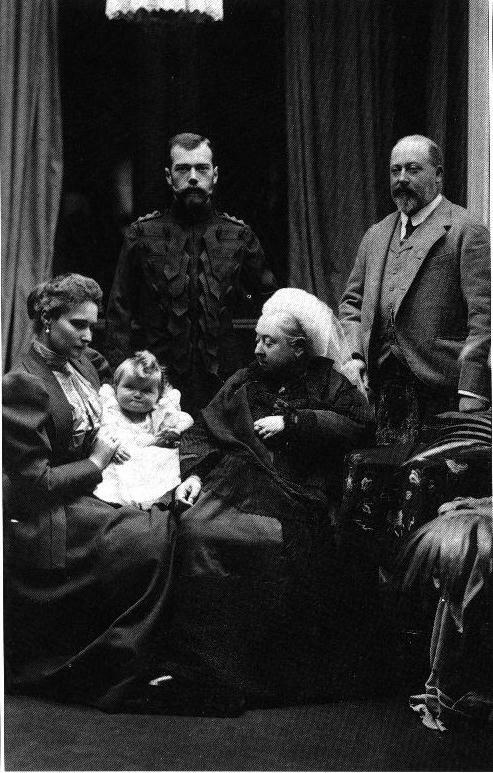 But my requests had no influence on her, for she acted independently..."
Once, in December, 1916, the Emperor and Empress went for the day with two of the Grand-Duchesses to Novgorod, where they visited some hospitalsand monasteries and attended the Liturgy in the cathedral of Saint Sophia. Before leaving, the Empress visited the Yuriev and Desyatina monasteries. In the latter there lived the eldress Maria Mikhailovna, who was according to different accounts 107 or 116 years old and who for many years had been lying on an iron bed in iron chains. According to the Empress' own account in a letter to the Tsar: "She blessed and kissed us. She sends you an apple (perhaps you'll eat it). She said that the war will soon end - 'tell him that we've had enough.' To meshe said: 'As for you, beauty - a heavy cross - don't fear.' (She repeated this several times.) 'Because you came to us, two churches will be built in Russia (she repeated this twice) - don't forget us, come again.'" "Here comes the martyr - the Tsaritsa Alexandra!" She embraced her and blessed her. A few days later she died. her, by the evil monk Rasputin. However, General A.I. Spiridonovich, having mentioned the empress' insistence on not trusting anybody but Rasputin, Vyrubova and Sablin, comments: "The Emperor understood all this well and very frequently acted against her advice, guided by his own experience. Sometimes his decisions coincided with the Empress' wishes. But to claim indiscriminately that the Emperor acted in state matters only according to the Empress' wishes is a great mistake. This means ignoring the facts as well as the character and principles of the Emperor. Emperor Nicholas was far from being as simple-minded and weak-willed as many thought." some of Nicky's letters to Alicky are proof enough of what he really thought of Rasputin's advice..."
The enemies accused the Empress of pro-German sympathies because of her German blood. But her letters demonstrate beyond a shadow of doubt that she was completely devoted to Russia. In any case, as the French ambassador pointed out, "her education, her intellectual formation and her morals were entirely English." In May, 1917, a Sarov archimandrite, who was sorrowing over the fate of the Royal Family, fell asleep during prayer and saw a vision of the Family together with St. Seraphim. And the saint told him not to sorrow, that God would not forsake his chosen ones, and that He had sent him, Seraphim, to comfort the Royal sufferers in the hour of their trial. "Do you see the radiant light come from the faces of the Royal sufferers? This is a sign that they are under the special protection of God, as being righteous ones... Look at the face of the Empress and you will see that the light coming from it is brighter than the others. This is a sign that she will suffer more slander than any from the followers of the world's slanderer." There had been even earlier prophecies of the martyrdom of the Tsar and Holy Russia. Thus A.D. Khmelevsky writes: "[Towards the end of the eighteenth century] the clairvoyant monk Abel wrote a prophecy entitled 'On the destinies of the Russian realm' for the Emperor Paul I Petrovich which referred to his great-grandson, the Emperor Nicholas II. This prophecy was placed in an envelope and sealed with the personal seal of the Emperor Paul I and with an inscription in his own hand: 'To be opened by our successor on the one hundredth anniversary of my death.' The document was kept in a special room in the Gatchina palace. All the emperors knew about it, but none dared to oppose the will of their predecessor. On March 11, 1901, when 100 years had passed in accordance with the behest, the Emperor Nicholas II came to Gatchina palace with the minister of the court and members of his suite and, after a funeral service for the Emperor Paul, opened the packet and learned of his thorny destiny. The writer of these lines knew about this already in 1905. "'There will a Tsar who will glorify me, after which there will be a great disturbance in Rus', and much blood will flow because they will rise up against this Tsar and the autocracy, but God will exalt the Tsar...'"
The enemies of Holy Russia knew well that the greatest unifying factors in Russia were the love of God and love for the Tsar, the visible symbol of the Orthodox Empire. By cutting off the head, they hoped to render the body powerless through fragmentation, thereby making it malleable to their evil intents. Through infiltration of the press, slanderous stories against the Royal Family were printed. The foreign press, hungry for scandal, printed unverified stories, many of which are still believed to this day. Even the Empress was accused of disloyalty and treason - she who was above reproach in her heartfelt love for her adopted land. Conspiracies began to take shape among court officials, the Duma (Parliament), the generals and the nobility, even including relatives of the Tsar. This, at a time when unity was more than ever needed. "Are you confident that my abdication will save Russia from bloodshed?" Again they reassured him that it would. "All around me I see treason, cowardice and deceit." "What is left for me to do when everyone has betrayed me?" On the day of the abdication the enemies had arranged that the Emperor should not meet his strongest supporter, the Empress. She understood this and wrote: "My heart is rent with suffering, since you are completely isolated. It is clear that they do not wish to allow us to see each other before you sign some sort of paper. If they compel you to make concessions, you are under no circumstances obliged to fulfil them, because they are obtained by unworthy means. We are all of good cheer, but pressured by circumstances. We only suffer for you and endure humiliation for you, holy sufferer..."
And after the abdication, the Empress wrote to the Emperor: "You will be crowned by God Himself on this earth, in your own country..."
And so, after an entire night spent in prayer, he laid aside the crown for what he felt was the good of his country. For, as he wrote: "I am ready to give up both throne and life if I should become a hindrance to the happiness of the homeland." And again: "There is no sacrifice that I would not make for the real benefit of Russia and for her salvation." Metropolitan Anastasius writes that the emperor "was far removed from the idea of defending his authority only for the sake of the desire to rule. 'Are you sure that this will be to Russia's benefit?' he asked those who, supposedly in the name of the nation, presented him with the demand that he renounce his hereditary rights, and when he received a positive answer, he immediately laid aside the burden of royal government, fearing lest a single drop of Russian blood might fall on him in case a civil war arose." "Just to think that, now I am Tsar no longer, they won't even let me fight for my country." At the very moment of the Tsar's abdication - 3 o'clock on March 2, 1917 - a miracle took place that attested to God's love for Russia. In the village of Kolomenskoye, near Moscow, according to a revelation of the Mother of God, a search had been taking place for several days for her icon "The Reigning Mother of God". This icon had gone at the head of the Russian army in 1812 as it drove Napoleon out of Russia. But then this wonder-working icon had been forgotten and seemingly lost. No one knew about its fate. And only on March 1, 1917, did a pious widow by the name of Eudocia receive a revelation to look for the icon in the village of Kolomenskoye. She looked through both of the churches of the village, but did not find the icon. Then she asked whether they had any old icons. They told her that there were some in the basement. She asked to go there, and she and a deacon went down into the basement. although it was still covered with a thick layer of dust which made it impossible to recognise. But when they cleaned it, it was true: the wonder-working icon of the Mother of God had been found. It depicted the Mother of God seated on a throne, her countenance both stern and sorrowful, an orb and sceptre in her hands and the Christ-child giving a blessing in her lap, with God the Father looking down from above. This icon soon thereafter miraculously renewed itself and the robe of the Mother of God was seen to be blood red, something which had been foretold also in the dream. Services were written to this icon and many people made the pilgrimage to venerate it. Healings, both of physical and mental infirmities began to take place before it. "The Mother of God said: if they take it round the Kremlin seven times, the Bolsheviks will not be able to capture it!" But this was not done. The Bolsheviks put the icon in a museum under the title "A counter-revolutionary icon of the Mother of God". Recently, it has been returned to Kolomenskoye. 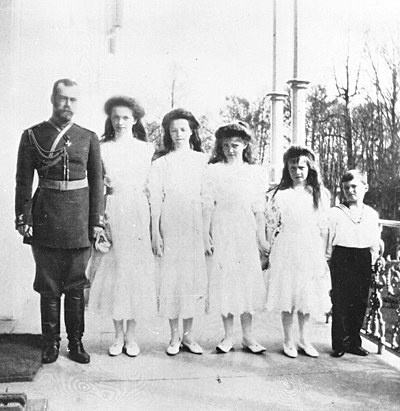 After the abdication, on March 9, the Tsar arrived back in Tsarkoye Selo, where his family were all under house arrest like common criminals, and found all of his children ill. Alexis, Olga and Maria had the measles and were bedridden with high fevers; Tatiana and Anastasia both had painful ear abscesses, which left Tatiana temporarily deaf. Again the image of Job overshadowed him - all had been taken from him except his dear ones and his indomitable faith. He did not curse his fate, accepting all as the will of God, and did not even murmur against his captors who treated him with disrespect and even contempt. What greater example could the Russian people have asked for, or what nobler man could have led them as their king? Thus Christ's lament over the chosen people was fulfilled in Holy Russia as well: "How often would I have gathered thy children together, even as a hen gathereth her chickens under her wings, and ye would not! Behold, your house is left unto you desolate" (Matthew 23.37-38). "I will pray fervently for you and Maria. With God everything will pass. Be patient and pray." And shortly after the abdication the Empress said: "Our sufferings are nothing. Look at the sufferings of the Saviour, how He suffered for us. If this is necessary for Russia, we are ready to sacrifice our lives and everything." And again: "I love my country, with all its faults. It grows dearer and dearer to me... I feel old, oh, so old, but I am still the mother of this country, and I suffer its pains as my own child's pains, and I love it in spite of all its sins and horrors... Since [God] sent us such trials, evidently He thinks we are sufficiently prepared for it. It is a sort of examination... One can find in everything something good and useful - whatever sufferings we go through - let it be. He will give us strength and patience and will not leave us. He is merciful. It is only necessary to bow to His will without murmur and wait - there on the other side He is preparing for all who love Him indescribably joy." The Royal Family left Tsarksoye Selo on July 31, and on August 6 they arrived in Tobolsk on the ship "Rus", as the provisional government began to collapse amidst Bolshevik ravings. Many Russians everywhere behaved as though in a trance, against their better instincts, or even worse - as though possessed. The Tsar and his family remained in Tobolsk until the following April, taking comfort only in prayer and in each other. "I can in no way forgive myself for having given up power. I never expected that power would fall to the Bolsheviks. I thought that I was giving up power to the representatives of the people..."
"Who needs this? I very well know that the people still love me and are faithful to me, but now there will be unpleasantnesses, and they won't let us into the cathedral again." And so it turned out. But thanks to this, the protopriest was invited to the house to perform services, and in this way got to know the Family better. The princesses sang simply and harmoniously. They had good books in which they followed the services. The Tsar also assisted the priest during the services. Once the Tsar sent Bishop Hermogenes of Tobolsk a bow to the earth, asking him to forgive him that he had been forced to allow his removal from his see. He could not have done otherwise at the time, but he was glad to have the opportunity of asking the bishop's forgiveness now. The bishop was very touched, and sent a bow to the earth to the Tsar together with a prosphora and asked for his forgiveness. "The Tsaritsa has asked me to give this to you. Take it back to England, and ask the English people to pray for the safety of her children." The Rev. Vaughan-James was very surprised. The woman left the compartment, and the train returned to the port. After returning to the ship, the Rev. Vaughan-James was told that a telephone message had come from London, ordering the ship to return to England without the Tsar and his family. The rescue operation had been cancelled. No reason was given. On the way home all the crew were depressed, and while they were still at sea it was announced on the radio that the Tsar and his family had been killed. The Rev. Vaughan-James did not know what to do with the icon, and gave it to the Admiralty, where, he said, it still hung in one of the rooms. However, a search recently undertaken at the Admiralty did not reveal the icon. A commissar arrived from Moscow and informed the Tsar that the was being taken away that night. The Tsar feared that he would be forced to sign the Brest-Litovsk treaty, but the commissar assured him that that was not the case. The Tsar insisted on allowing someone to accompany him, and the Tsaritsa suffered much, not knowing whether to follow her husband or to remain with her sick son. Finally, after much heartbreak, she decided to entrust her son to his tutor and to follow her spouse. The parents and children had never been separated, but now they had to be, and this on the eve of Pascha, which they had always celebrated together. On April 13/26, the Royal Couple left Tobolsk and covered 285 versts by wagon, reaching the railhead. On April 17/30, the Tsar, the Tsaritsa and Grand Duchess Maria Nikolayevna with some members of the servants, arrived in Ekaterinburg and were imprisoned in the home of the engineer Ipatiev. On May 10, the remaining members of the family arrived. "The courage of the prisoners was sustained in a remarkable way by religion. They had kept that wonderful faith which in Tobolsk had been the admiration of their entourage and which had given them such strength, such serenity in suffering. They were already almost entirely detached from this world. The Tsaritsa and Grand Duchesses could often be heard singing religious airs, which affected their guards in spite of themselves. "Gradually these guards were humanised by contact with their prisoners. They were astonished at their simplicity, attracted by their gentleness, subdued by their serene dignity, and soon found themselves dominated by those whom they thought they held in their power. The drunken Avdiev found himself disarmed by such greatness of soul; he grew conscious of his own infamy. The early ferocity of these men was succeeded by profound piety." When this would happen, the inhuman Bolsheviks would replace the guards who had been so touched with crueller and more animalistic ones. Seldom being allowed to go to church, they nevertheless nourished their souls with home prayers and greatly rejoiced at every opportunity to receive the Divine sacraments. Three days before their martyrdom, in the very house in which they were imprisoned, there took place the last church service of their suffering lives. As the officiating priest, Fr. John Storozhev, related: "'It appeared to me that the Emperor, and all his daughters, too, were very tired. During such a service it is customary to read a prayer for the deceased. For some reason, the Deacon began to sing it, and I joined him... As soon as we started to sing, we heard the Imperial Family behind us drop to their knees' (as is done during funeral services)... Thus they prepared themselves, without suspecting it, for their own death - in accepting the funeral viaticum. Contrary to their custom none of the family sang during the service, and upon leaving the house the clergymen expressed the opinion that they 'appeared different' - as if something had happened to them." "We are one, and this, alas, is so rare today. We are tightly united together... a small, tightly knit family..."
Inseparable in life, they were now to remain unseparated in death. After midnight on July 4/17, 1918, the entire family, with their doctor and two faithful servants, was brought to the basement of the house of their confinement under the pretext of moving them once again. There they were brutally and mercilessly murdered, the children as well as the adults, under the cover of darkness - for "men loved the darkness rather than light, because their deeds were evil" (John 3.19). The Tsar was shot as he stood forward to defend his family. 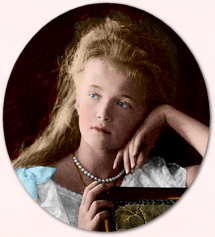 Tsaritsa Alexandra was able to make the sign of the Cross before she, too, fell. The first bullets did not bring death to the youngest ones, and they were savagely clubbed, bayoneted and shot at point-blank range. Those killed were: the Tsar (born 1868), the Tsaritsa (1872), Olga (both 1895), Tatiana (1897), Maria (born 1899), Anastasia (born 1901), Alexis (born 1904), the Tsar's physician Eugene Botkin, the Tsaritsa's chamber-maid Anna Demidova, the cook Kharitonov and the servant Trupp. The sailor Clement Nagorny, who had looked after the Tsarevich since early childhood, and Sergius Sednev, the servant to the Grand Duchesses, both of whom had defended the Royal Family from robbery and insults in Ekaterinburg, were taken away to prison and shot there. Those who were refused permission to stay with the Royal Family at Ekaterinburg, and who were also shot in prison were General Elias Tatishchev and Prince Basil Dolgorukov. The maid-of-honour, Countess Anastasia Hendrikova, and the court teacher, Ekaterina Schneider, were taken to Perm and shot there. "Yes! Up to the last day of my life!" "The Tsar's with bayonets! Cursed Jews!" On the same night Belshazzar Von seinen knechten umgebracht. Was killed by his own slaves. But the truth was quite the opposite. Belshazzar hated the people of God, and his removal opened the way for the rebuilding of the Temple of God in Zion by the Jewish Prince Zerubbabel. The killing of Tsar Nicholas, on the other hand, opened the way to the destruction of Orthodox Russia and its transformation into Babylon. Thus ended the life of the Christ-like Tsar, as a sacrifice for the Orthodox Faith and for the Russian people, both of whom he so fervently loved and believed in. Martyr-Great-Princess Olga Nikolayevna wrote from Tobolsk: "Father asks the following message to be given to all those who have remained faithful to him, and to those on whom they may have an influence, that they should not take revenge for him, since he has forgiven everyone and prays for everyone, that they should not take revenge for themselves, and should remember that the evil which is now in the world will be still stronger, but that it is not love that will conquer evil, but only love..."
Now as we stand before the gates of death, Breathe in the lips of us Thy servants That more than human, supernatural strength To meekly pray for those that hurt us. "'The Tsar has taken the guilt of the Russian people upon himself, and the Russian people is forgiven.'" "Then before the throne of God there stood our Tsar wearing the crown of a great-martyr. Yes, this tsar will be a great-martyr. Recently, he has redeemed his life, and if people do not turn to God, then not only Russia, but the whole of Europe will collapse..."
The sanctity of the Tsar has been revealed in a number of miracles. "Today is the day of the commemoration of the Tsar-martyr. 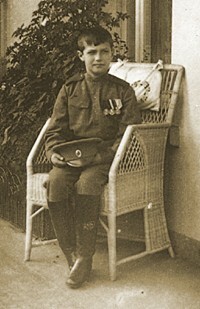 His son, the young Tsarevich Alexis was the honoured ataman of the Cossack armies. Let us beseech them that they intercede before the Lord for the salvation of the Christ-loving Cossack army." And Fr. Elijah served a moleben "to the Tsar-martyr, the Emperor of Russia". And the refrain during the moleben was: "Holy Martyrs of the Royal House, pray to God for us!" The whole company sang. At the end of the moleben, Fr. Elijah read the dismissal: "Through the prayers of the holy Tsar-martyr Nicholas, the Emperor of Russia, his Heir the young Tsarevich Alexis, ataman of the Christ-loving Cossack armies, the right-believing Tsaritsa-martyr Alexandra and her children the Tsarevna-martyrs, may He have mercy and save us, for He is good and loveth mankind." To the objection that these holy martyrs had not yet been glorified, and miracles from them had not yet been revealed, Fr. Elijah replied: "Through their prayers we shall get out... They have been glorified... You yourselves have heard how the people has glorified them. The people of God... May the holy youth Tsarevich Alexis show us. Don't you see the miracle of the wrath of God on Russia for their innocent blood?... You will see revelations through the salvation of those who honour their holy memory... There is an indication for you in the lives of the saints. You will read that Christians built churches over the bodies of the holy martyrs without any glorification. They lit oil-lamps and prayed to them as to intercessors and petitioners..."
The company and transport got out of the encirclement in a miraculous manner. They were walking up to their knees, even up to their waist in mud. Sometimes they sank in even up to their necks. The horses got stuck, but then jumped out and went on... They didn't remember how far they went or how tired they were... And they got out... 43 women, 14 children, 7 wounded, 11 old men and invalids, 1 priest and 22 Cossacks - 98 people and 31 horses in all. They came out on the other side of the swamp, on the corner of land which was occupied by the Cossacks who were holding back the encircling movement of the Reds, straight into the middle of their own people. None of the locals could believe that they had come through by that route. And the enemy had not heard the noise made by their passage. And the in the morning the Red partisans could not find any trace of where they had got away. There had been people - and then there were none! Again, the nun Barbara (Sukhanova) writes: "In the summer of 1923 a girl known to me by the name of Irina Meier received a letter from Petrograd from her friend - also a young girl of gentry family. I am amazed that this letter got through at that time. The girl from suffering Russia openly wrote that with the help of God she had decided to choose the monastic path and was striving for it with all her heart. "And an invisible person replied: 'In the name of the slaughtered Emperor Nicholas Alexandrovich.'" Again, Monk Zachariah writes: "The Serbian people loved the Russian Tsar with all their heart. 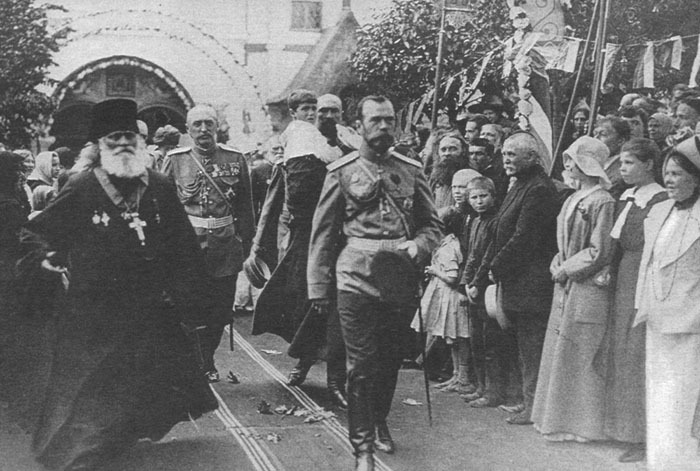 On March 30, 1930, there was published in the Serbian newspapers a telegram stating that the Orthodox inhabitants of the city of Leskovats in Serbia had appealed to the Synod of the Serbian Orthodox Church with a request to raise the canonization of the late Russian Emperor Nicholas II, who was not only a most humane and pure-hearted ruler of the Russian people, but who also died with the glory of a martyr's death. "Already in 1925 there had appeared in the Serbian press an account of what happened to an elderly Serbian lady who had lost two sons in the war and whose third son, who had disappeared without a trace, she considered also to have been killed. Once, after fervently praying for all who had been killed in the war, the poor mother fell asleep and saw in a dream the Emperor Nicholas II, who told her that her son was alive and was in Russia, where he had fought together with his two dead brothers. 'You will not die' - said the Russian Tsar - 'until you see your son.' Soon after this dream, the old woman received news that her son was alive, and within a few months after this she joyously embraced him alive and well when he returned from Russia. "On August 11, 1927, in the newspapers of Belgrade, there appeared a notice under the headline, 'Face of Emperor Nicholas II in the monastery of St. Naum on Lake Ochrid.' It read as follows: 'The Russian painter S.F. Kolesnikov was invited to paint the new church in the ancient Serbian monastery of St. Naum, being given complete creative freedom in adorning the interior dome and walls. While completing this, the artist thought of painting on the walls of the church the faces of fifteen saints, to be placed in fifteen ovals. Fourteen faces were painted immediately, but the place for the fifteenth long remained empty, since some kind of inexplicable feeling compelled Kolesnikov to wait for a while. Once at dusk he entered the church. Below, it was dark, and only the dome was cut through with the rays of the setting sun. As Kolesnikov himself related later, at this moment there was an enchanting play of light and shadows in the church, and all around seemed unearthly and singular. At this moment the artist saw that the empty oval which he left unfinished had become animated and from it, as from a frame, looked down the sorrowful face of Emperor Nicholas II. Struck by the miraculous apparition of the martyred Russian Tsar, the artist stood for a time as if rooted to the spot, seized by a kind of paralysis. Then, as he himself describes, under the influence of a prayerful impulse, he leaned the ladder against the oval, and without marking with charcoal the outline of the wondrous face, with brushes alone he made the layout. He could not sleep the whole night, and, hardly had the first daylight appeared than he went to the church and in the first morning rays of the sun was already sitting high on the ladder, working with such a fever as he had never known. As he himself writes: 'I painted without a photograph. In the past I several times saw the late Emperor close up, while giving him explanations at exhibitions. His image imprinted itself in my memory." "'What kind of celebration, Vladyka?' I asked. "And having bowed to me slightly, he continued on his way to the kathedra (in the centre of the church). Finally, the holy doors of the altar opened, and out of them came the Tsar-Martyr, looking just as he appears on his official portraits during the first years of his reign - that is, very young. 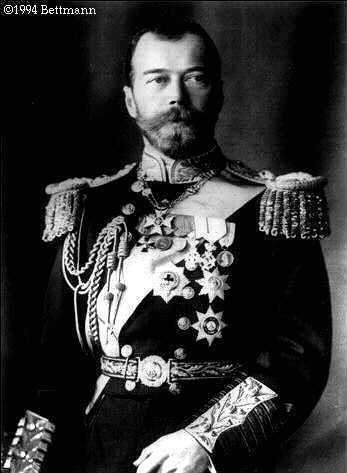 He was dressed in the Tsar's royal mantle, as during his coronation, and he wore the emperor's crown on his head. In his hands he held a large cross, and on his pale face I noticed a slight wound, either from a bullet or some blow. He passed by me at an even pace, descended the step of the ambo, and went into the centre of the church. As he neared the kathedra, the singing increased in volume, and when his foot touched the step of the kathedra, it became so loud that it seemed that a whole world of people had gathered and were singing with one breath." Again, there not a few living witnesses of the miracle that took place in the Ipatiev house in Ekaterinburg=E2=80=A6 The miracle took place in that same cellar in which his Majesty, in the likeness of the Divine Redeemer of the world, voluntarily offered himself in sacrifice for the sins of his people. The wall riddled with holes from the bullets of the regicides oozed blood for many years. The authorities plastered up and painted over the wall, but drops of fresh blood continued to appear through the holes made by the bullets. A janitor who worked in the house, and was apparently a believer, used to say that on the eve of feasts such as the Nativity of Christ, Pascha and Pentecost, when she had to stay in the house during the night, she heard a sound as if of angelic chanting coming from the cellar. The house was destroyed during the time that Boris Yeltsin was head of the party organization in Ekaterinburg. Now a cross with an icon of the Tsar-Martyr stands in its place. Again, in 1988, Claude Lopez, an Orthodox Christian from Switzerland, wrote that one day he, having great veneration for the New Martyrs, had placed a commemorative coin of the Tsar in his icon corner, along with an icon of the Royal Martyr with a halo. One day he noticed moisture on the coin and discovered that it was exuding a quantity of fragrant myrrh, which had flowed into the box in which it was kept. This obvious miracle continued until October of 1988, and resumed briefly during Autumn of 1989. Orthodox Church. Now, through God's mercy, I've become a member (August, 1989). During four years I had had a pain in the loins and in the belly on the right side. I consulted various doctors and went through the usual routine (x-rays, ecography, etc., and analyses). All the results were negative. It was deduced that my pain was psychosomatic (psychological). To calm me down, I was treated through acupuncture and laser, but in vain; my pain was still there. I was desperate. One night I was experiencing again acute pain, I started reading. To mark my page I had put a portrait of Tsar Nicholas (his icon, in fact). I looked at the icon and he (the Tsar) looked at me. I started asking him to pray to Christ our Lord; for having suffered during the last days of his life, he would have compassion. I accepted the pain that I had but I could not accept the fact that I was 'mad', becauseI knew that my pains were real. On the next day, after that very night, as I was on my way to a job, a client who is also a friend of mind asked how Iwas and upon knowing that I was still suffering, he asked whether I had consulted Dr. P. I answered no. He told me to go and see him on his behalf. I went there on the next day. When he examined me he said that there was nothing psychosomatic; I had an invisible (on the radio) kidney stone. I underwent a 'natural treatment' and the stone went out naturally after one month. During this period of time I prayed to the Lord to remember me because of my love for the Tsar. I promised to Tsar Nicholas that I would distribute and make known his icon as a 'moleben' for the mercy he showed to the poor man who suffered for four years and saw his problem solved in less than a month through his intercession. Thank you, Saint Nicholas II, I am very thankful." (Sources: Metropolitan Anastasius, "Homily on the Seventh Anniversary of the Martyric End of Emperor Nicholas II and the Entire Royal Family", Orthodox Life, vol. 31, no. 4, July-August, 1981; An Orthodox Priest, "The Sovereign Passion-bearer Nicholas Alexandrovich", Orthodox Life, vol. 31,no. 4, July-August, 1981; Ludmilla Koehler, Saint Elisabeth the New Martyr, New York: The Orthodox Palestine Society, U.S.A., 1988; R. Monk Zachariah (Liebmann), "The Life of Tsar-Martyr Nicholas II", The Orthodox Word, vol. 26, no. 4 (153), July-August, 1990; Schema-Monk Epiphany Chernov, Tserkov' Katakombnaya na Zemlye Rossijskoj (MS); Ogonek, N 22 (3280), May 26 - June 2, 1990; I.M. Kontsevich, Optina Pustyn' e yeyo vremya, Jordanville: Holy Trinity Monastery, 1970, pp. 498-99; Fr. Nikita Chakirov, Tsarskiye Koronatsii na Rusi, Russian Orthodox Youth Committee, 1971; Nikolai Kozlov, Krestnij Put', Moscow, 1993; Enel, "Zhertva", Kolokol', Moscow, 1990, N 5, pp. 17-37, and Michael Orlov, "Ekaterinburgskaya Golgofa", Kolokol', 1990, N 5, pp. 37-55; A. Shiropayev, "Pobyeda Imperatora Nikolaya II", Kolokol', N 1, 1990, pp. 43-53; "Starets Varnava Gefsimanskij", Pravoslavnij Put', 1990,pp. 130-31; A.D. Khmelevksy, "Tainstvennoye v zhizni gosudarya Imperatora Nikolaya II-go", Pravoslavnaya Rus', no. 13 (1442), 1/14 July, 1991, p. 9; "Rasskazy monakhini Varvary (Sukhanovoj)", Pravoslavnaya zhizn', no. 7 (498), July, 1991, p. 18; Sergius Fomin, Rossiya pered vtorym prishestviyem, Holy Trinity Monastery, Sergiev Posad, 1993, pp. 129, 132, 143, 155, 157, 158, 160, 169; Dominic Lieven, Nicholas II, London: Pimlico, 1993, pp. 34-35, 47,162-163; Robert Massie, The Romanovs: The Last Chapter, Jonathan Cape, 1995; Protopriest Alexander Shargunov, Chudesa Tsarstvennykh Muchenikov, Moscow: "Novaya Kniga", St. Petersburg: "Tsarskoye Delo", 1995; Orthodox America, January, 1997, pp. 11-12; Nikolaj II: Venets zemnoj i nebesnoj, Moscow, 1997, pp. 116-120).